I'm excited by this dessert, why, because it is delicious, because it is so easy to make, because it looks amazing, because it is amazing. I am one of those people that finds food shows not only interesting, but also relaxing. I could watch them all day, everyday. My whole family has been sick with the flu this week, normal people rest, no not me, I cook. After seeing this made on the food network, my new favourite channel, I had to make it. This is a very simple dish, anyone can make this. If you have never made a dessert, you should make this, you will impress your family and friends with this pie. Is it a pie, not really, it just looks like one. It is more like an ice cream, but it is better, because it is easier to make than an ice cream. This is a frozen treat that melts in your mouth. I recommend you don't want it frozen solid, you want it frozen, but just soft enough to slice it nicely. The yoghurt I used was Yoplait, use whatever raspberry yoghurt you love. If you don'y have cottee's instant pudding, use whatever brand you have available. You can completely decorate the pie in one go and freeze until needed. Just don't add whipped cream, it doesn't freeze well. If it freezes solid, for instance if you make it the day before, just allow 30 minutes defrosting time, before slicing. Spring is here, summer is coming, you need to make this. It would be a perfect finish to a barbecue. To make the crust: Place the Oreos in a food processor and blitz until you have a fine crumb (or smash in a ziptop bag with a roling pin). Stir in melted butter until combined. Pour into a regular pie pan and press the crumbs all over the pan and up the sides. Bake just long enough for it to set, 3 to 4 minutes. Let cool completely. 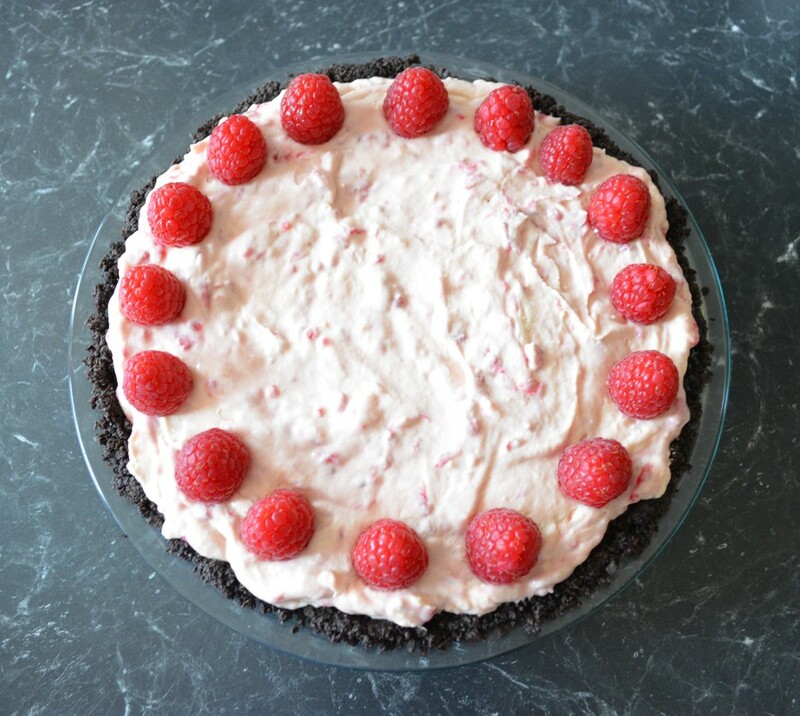 Remove the best 12 raspberries, set aside for decorating at the end. The remainder of the raspberries, put them in a bowl. Smash them up with a fork, then sprinkle on the sugar. Stir together, allow it to sit for 15 minutes for the sugar to dissolve. In a large bowl, add the raspberry yoghurt and the instant vanilla pudding powder. Using an electric hand held mixer, beat on low until combined, about 1 minute. Pour in the thickened cream and beat on low for 30 seconds. Stop the mixer, scrape down the bowl with a rubber spatula. Now beat again on medium speed and beat until thick, about 1 to 2 minutes. Turn off the mixer, pour in your smashed raspberries, then fold them in gently with your spatula, until just combined. I like to see raspberry ripples through the mix, so don't over mix. Pour into the cooled crust and spread evenly. Freeze until very firm, about 2 hours. 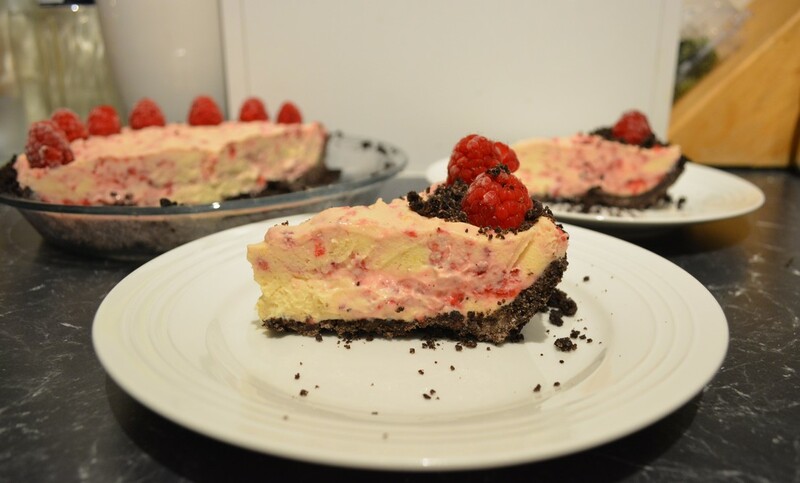 Cut into slices and top each slice with cookie crumbs, dollops of whipped cream and the reserved raspberries.